Later, I did not know what happened to me or what triggered me and I started investigating these tiny glittering birds. Hummingbirds are very territorial and they are “site fidelity” but they have personality (I am not sure about this term of ” personality”). A lot of time, human would come up with some conclusions for the things they like so much by adding “personality onto them” to make things they like become special to them. Or I could say for the benefit of our best interest. So I’d rather to study more about this bird before the truth come out. 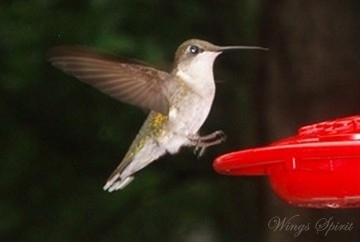 However, the more I learned about hummingbirds, the more I became attached to them, their behavior and their “personalities”. I went to Georgia hummer society and some other websites to study this amazing creature. It reminded me how excited mom was when she told me she saw a hummingbird in front of her bedroom about the same time a year earlier (I was visiting my birth place oversea in September 06 and came back with mom that year. A note here: hummingbirds do not live in Asia or Europe. I am not sure why I will do more research on that). And, since I have never seen one and I doubted my mother when she told me.